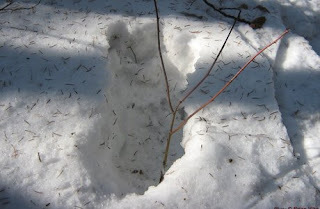 Brian Vike snapped this photo of what he believes is a sasquatch footprint in Moricetown, B.C. 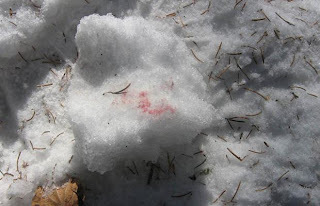 Blood on a snow fragment is being tested. Brian Vike believes he has photographic evidence that sasquatches exist. No, he doesn’t have a photo of a sasquatch, but he does have a photo of a very large footprint. The Houston, B.C.-based UFO researcher has developed a soft spot for the mythical furry creatures, and got an excited call last Sunday from the remote community of Moricetown. “I made the 90-minute drive up there, and I was amazed at what I saw,” Vike told The Province. “I’ve been on some of those turkey runs, when there’s nothing to see. 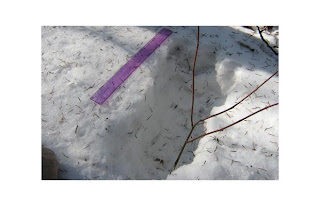 “But there were footprints, 17-and-a-half inches in length, that went on for a long ways. More tellingly for Vike, the snow around the prints was untouched. Vike, who tracks UFO sightings, got even more excited when he found blood in one of the prints. Sasquatches are allegedly ape-like beings that apparently are quite shy, since they don’t seem to interact with humans much. Like the yeti and the ogopogo, sightings are frequently reported, but no conclusive proof of their existence has ever been found. On the other hand, conclusive proof that they do not exist does not exist. This blog never let's me down. The interesting subject matter leaves me wanting more.